← A Return to Plessy vs. Ferguson? 40. I can choose public accommodation without fearing that people of my race cannot get in or will be mistreated in the places I have chose. #7 and #46 seem to define the macro-micro ends of a spectrum, though on an everyday level, I’m not sure that #46 isn’t as big—the point being that people of color have to think about things like this that whites rarely do. In her book Racing Across the Lines (read a review of it HERE), Deborah Plummer asks whites to go around for a full day thinking of themselves as white. When I ask whites to do this, the response is almost always, “I don’t think of myself as white!” or “When I see people, I don’t see colors.” Exactly. That’s a privilege. And that’s why intentionally thinking about your whiteness is usually an eye-opening experience. I have a personal story, sometimes many more than one, for #’s 18, 20, 25, and 40—especially #25, the dreaded “being pulled over” type—which I’ll defer to another day, except for one #18 story that involves me more indirectly. You can find “White Privilege: Unpacking the Invisible Knapsack” at many places on the web (like http://www.amptoons.com/blog/files/mcintosh.html), but according to the Wellesley Centers for Women’s website, on the page featuring Dr. McIntosh, these versions are all pirated and unofficial. Even the url above directs you to a more official version. So please visit http://www.wcwonline.org/Active-Researchers/peggy-mcintosh-phd for more information on Dr. McIntosh and the official versions of this important essay. At this official url you’ll also find links to other interesting spinoffs, including her talk at Harvard on how to use privilege constructively. Which brings me back to #9 above. It’s about publishing. The only thing better would have been to have a conservative white man write something like Dr. McIntosh did, and some have (more on this later), though the depth and force of “White Privilege: Unpacking the Invisible Knapsack” may always be the standard against which all will be judged. 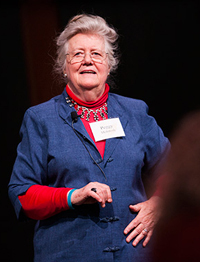 Dr. McIntosh, besides being associate director of the Wellesley Centers for Women, also founded the National SEED Project on Inclusive Curriculum (Seeking Educational Equity & Diversity), helping teachers create their own seminars on making school climates, K-12 curricula, and teaching methods more gender fair and multi-culturally equitable. She directs the Gender, Race, and Inclusive Education Project (providing workshops on privilege systems, feelings of fraudulence, and diversifying workplaces, curricula, and teaching methods), co-founded the Rocky Mountain Women’s Institute, and has been consulting editor to Sage: A Scholarly Journal on Black Women. She has taught English, American Studies, and Women’s Studies at the Brearley School, Harvard University, Trinity College (Washington, D.C.), Durham University (England), and Wellesley College. This entry was posted in Diversity & Multiculturalism and tagged Harvard University, Peggy McIntosh, racism, SEED Project on Inclusive Curriculum, Wellesley Centers for Women, Wellesley College, white privilege, White Privilege: Unpacking the Invisible Knapsack. Bookmark the permalink. Dr. Guzman, I just happened to stumble across this wonderful website of yours! I will be teaching a course on multicultural counseling and I will be referring students to your site. What a wealth of thought provoking essays and information. Thank you!